Many assumptions in the future, mobility no longer need a big vehicle. The future will be more forward personality, including freight daily. 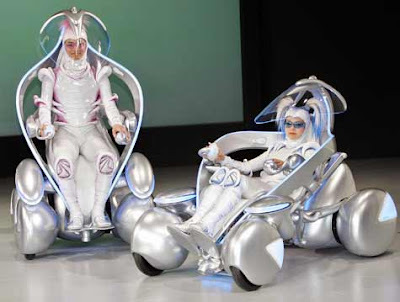 Back in 2004, when Toyota introduces a concept of future vehicles called 'i-Unit' featured at the Toyota Group Pavilion at EXPO 2005 in Aichi, Japan. By using the communication functions, i-Unit is designed as "Anti-Collision Car". Therefore, this concept allows the vehicle to be made in the small shape, lightweight and optimal energy utilization in the drive. As a result, to reduce the impact on the environment. Basic form of i-Unit consists of two types, ie a low-speed and high-speed mode. The i-Unit capable of performing any movements in a balanced manner in a room or on a public road and developed by offering "personal mobility" for the driver. The word "i" means "inspire the individual". While the word "Unit" not lead specificly to the vehicle, but are used to indicate to a genre or style. So that it can be interpreted the i-Unit as "i genre vehicles", which is a blend of the personality and the world. The i-Unit is controlled by the ITS (Intelligent Transport System). During the move, each i-Unit know the current the environment situation that occurs and associated with another the i-Unit through communication. The system works based on a concept which inspired by the movement of fish during the swim that not collide with each other in the same pool. With the development of ITS, this concept vehicle is able to minimize the number of accidents and even at intersections though. This concept vehicle is also able to reduce the negative impact on the environment. Grip of the steering wheel on the right side to drive the vehicle; return the steering handle to the starting position will reduce the speed. IT Controller is the supporting information for the driver to communicate interactively. The button is in the driver's left hand. By pressing the button with the finger will notice the driver's intention to the vehicle. At the same time, this button also transmits data from the vehicle via the indication lights, vibration and reaction power.